The pressures on fiscal consolidation have mounted dramatically in the wake of the Greek and then the 'contagion' crisis which followed it (across the so-called 'weakest links': Portugal, Spain, Italy, Ireland). It led to the setting-up of the 750 billion euro stabilisation package widely seen as a life-saving rescue operation of the euro-zone. In this commentary we want to examine whether the singular focus on fiscal adjustment which has now been given utmost urgency across the EU as a whole (i.e. not only the euro-zone) and also across Eastern European candidate countries and prospective candidate countries in the Western Balkans is justified. In the following we shall first examine the development of the 'three debts' (public, private and foreign) and then address the problems of stability and growth in the euro area and in the transition economies, both those in the EU as well as those aspiring to membership. 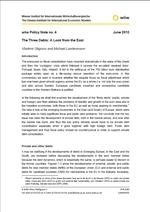 We take a look at the emerging economies in the East (and South) of Europe, which were initially seen to have significant fiscal and public debt problems. We conclude that the key issue has been the development of private debt, both in the bubble period, and now after the bubble has burst, and thus the key policy remedy would have to be private debt consolidation especially when it goes together with high foreign debt. Public debt management and thus fiscal policy should be countercyclical in order to support private debt consolidation.